From the Bulova Diamonds Collection. In stainless steel with a rose-gold ion-plated finish, 12 diamonds are individually hand-set on a white mother-of-pearl dial with rose-gold accents, domed sapphire crystal, white enamel bezel accents, luminous hands, second hand, and white leather strap. 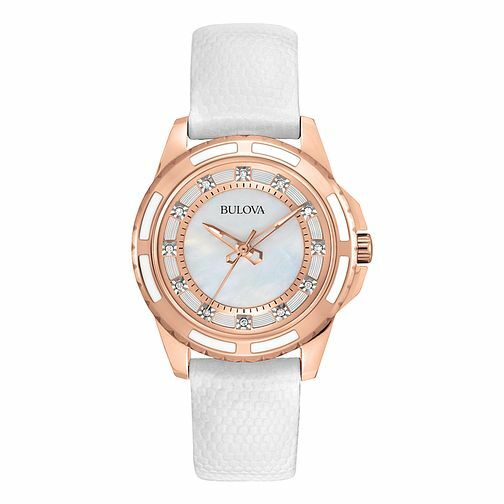 Bulova Ladies' Diamond Rose-Tone White Leather Strap Watch is rated 5.0 out of 5 by 1. Rated 5 out of 5 by Anonymous from Great watch Great watch for the price. Perfect gift for Christmas.